This month's Book of Me Scrapbook Layouts for the September Challenge will focus on our Favorite Things. Raindrops on roses and whiskers on kittens??? Who wrote that song and why were those a few of his favorite things? I'll never figure that one out, though that song is one that can stay in your head! Option #1 - I COLLECT ..... - Over the years I've collected a number of things, from gum wrappers to cookbooks, but there are a couple things that I collect that are so special to me that I will pass on to my children. Layout Ideas: Create a layout featuring your favorite collection with the history as to its origin. Not much text here, but you can sure tell what this lady collected. 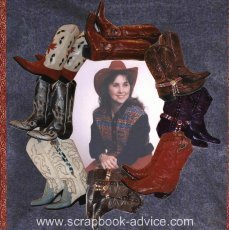 Individual photos were taken of each pair of boots. The photos were then cropped and arranged to make a frame around the photo. The opposing page to this layout had journaling in a Western style font about how this Western Boot Collection came about, how it has grown to 43 pair, and even a few shots from a store or two when they were being bought and how they are displayed in her home. Option #2 - MY FAVORITE ..... - Do you have a favorite flower or food? Perhaps a song, book, or author? Create a layout with a collaboration of favorites, or one featuring a favorite thing that makes you happy. Layout Ideas: Flowers, restaurant, shoes, vacation spot, store, website, food, song, book, author, music, movie, TV show, play, verse, quote, sport, animal, colors, game, car, type of food, etc., etc., etc. Be as practical or as frivolous as you like, and create a layout about some thing that means the world to you. Book of Me Scrapbook Layouts can really be fun and will show some thing special to remember about your personality. This can also be a time to remember just how thankful you are for everything you have.